Allow me to draw your attention to the padlock icon showing in the menubar above. By clicking on this icon i can very quickly send my computer into screen saver mode and, whats more, the user will be required to enter their login password to be able to exit the screen saver. This effectively locks your desktop while keeping you logged in and all of your documents and applications open, untouched, and secure! This option is buried in the preferences for an underused but very useful little application that comes with OS X called Keychain Access. So the first step will be to find and launch Keychain Access. 1. In the Finder, navigate to your Applications folder (ctrl + shift + A) and find the Utilities folder. Keychain Access lives in there. 2. Once inside Applications > Utilities. Double-click Keychain Access to launch the app. 4. 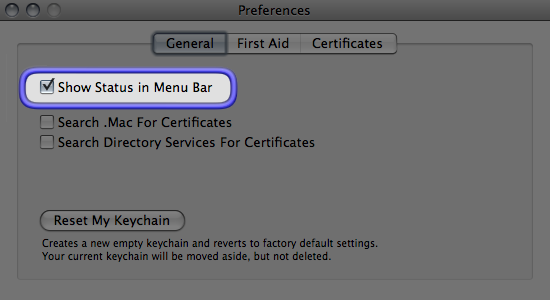 As shown in the above image, there is an option to “Show Status in Menu Bar”. Check that one. VOILA! 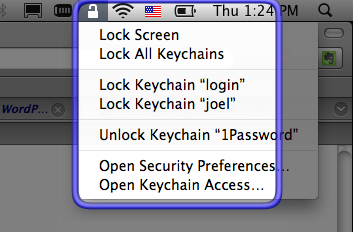 The padlock should magically appear in your menubar. 5. Now you can easily protect your desktop and any sensitive info without having to completely log out of your account by simply clicking on the padlock and selecting “Lock Screen”.